Progressive supranuclear palsy (PSP), also known as the Steele–Richardson–Olszewski syndrome, is a form of parkinsonism . It makes up the Parkinson-plus syndromes along with the other neurodegenerative disorders such as multiple system atrophy, corticobasal ganglionic degeneration, dementia with Lewy bodies, and frontotemporal dementia . Patients with PSP show interesting radiological signs such as the 'Humming bird sign' and the 'Mickey Mouse sign'. 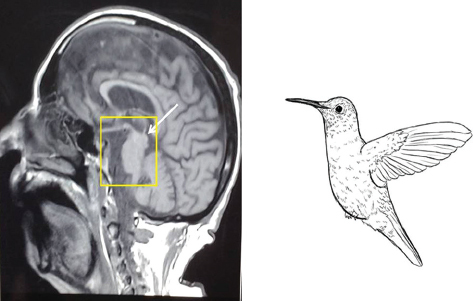 Here, we report a PSP patient in whom the MRI brain demonstrated both the 'Humming bird sign' and the 'Mickey Mouse sign'. A 70-year-old Indian man presented with a 2-day history of dysphagia, vomiting, and nasal regurgitation. He had a history of gradually progressive slowness of activities and slurring of speech over the past 2 years. The patient also had frequent episodes of falls while walking. There was no history of seizures, limb weakness, diplopia, facial asymmetry, tremulousness, hallucinations, forgetfulness, or urinary incontinence. Examination findings revealed slurred speech, conjugate vertical palsy, slowness of horizontal saccades, bradykinesia, and generalized hyper-reflexia. Glabellar tap was positive and the blink rate was 8–10/min. There were no tremors, cog-wheel rigidity, or autonomic features. Midsagittal T1-weighted MRI of the brain revealed midbrain tegmental atrophy without pontine atrophy, associated with widening of interpeduncular cistern giving the impression of head and body of a humming bird [Figure 1]. This is known as the 'Humming bird sign'. Figure 1: Midsagittal T1-weighted MRI of the brain showing midbrain tegmental atrophy without pontine atrophy, associated with widening of interpeduncular cistern giving the impression of head and body of a humming bird. 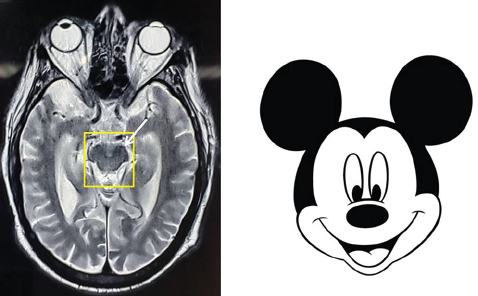 Axial T1-weighted MRI of the brain showed selective atrophy of the midbrain tegmentum with relative preservation of tectum and cerebral peduncles resembling the head of a Mickey Mouse [Figure 2]. This is known as the 'Mickey Mouse sign'. Figure 2: Axial T1-weighted MRI of the brain showing selective atrophy of the midbrain tegmentum with relative preservation of tectum and cerebral peduncles resembling the head of Mickey Mouse. PSP has a prevalence of 5–10/100 000 persons. The mean age at onset is 65 years. Patients die after an average of 8 years, often as a result of aspiration. Demonstration of the 'Humming bird sign' and the 'Mickey Mouse sign' on MRI brain is very sensitive in establishing the diagnosis of PSP . The 'Humming bird sign' is otherwise known as the 'Penguin sign'. 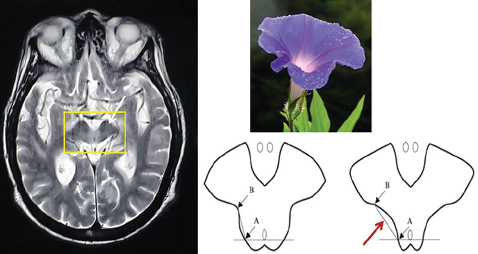 In view of the increased lateral concavity of the midbrain tegmentum, the 'Mickey mouse sign' is often called the 'Morning glory sign' [Figure 3] . Morphologically, the 'Morning glory sign' is related to vertical supranuclear gaze-palsy. Patients with Parkinson's disease, multiple system atrophy, corticobasal ganglionic degeneration, and dementia with Lewy bodies have no midbrain atrophy and do not show these radiological signs. Magnetic resonance Parkinson's disease index, defined as the ratio of midbrain area to pons area, is another helpful way in the diagnosis of PSP patients . Figure 3: Axial T1-weighted MRI of the brain showing increased lateral concavity of the midbrain tegmentum resembling morning glory. Red arrow in the pictorial representation explains the lateral concavity. On the basis of the clinical features and radiological signs, our patient was diagnosed as a case of PSP, the pathology of which is tauopathy compared with α-synucleinopathy in parkinsonism. The overall response to dopaminergic agents is poor in PSP in contrast to a good prognosis in Parkinson's disease . The treatment of PSP is now exclusively symptomatic. Therapeutic target symptoms include akinetic rigid symptoms, oculomotor impairments, neuropsychological deficits, and the occasionally occurring dystonia and sleep impairment. Furthermore, speech therapy and physiotherapy are indicated to prevent aspiration and falls. The current criteria of the National Institute of Neurological Disorders and Stroke and the Society for Progressive Supranuclear Palsy for the diagnosis of PSP are based on the clinical confirmation of the tendency to falls and oculomotor impairments. They are thus very sensitive for Richardson's syndrome, but less suitable for detecting the other clinical courses that PSP takes. MRI will show midbrain and frontal lobe atrophy. The parkinsonian symptoms generally improve only slightly in the levodopa test. In case of doubt, nuclear medicine methods can be used to confirm symmetric presynaptic nigrostriatal dopaminergic denervation (such as, FP-CIT-SPECT), postsynaptic striatal degeneration (such as, IBZM-SPECT), or hypometabolism in the frontal and midbrain regions (18 F-FDG-PET) to ascertain the diagnosis. Steele JC, Richardson JC, Olszewski J. Progressive supranuclear palsy: a heterogeneous degeneration involving brain stem, basal ganglia and cerebellum with vertical gaze and pseudobulbar palsy, nuchal dystonia and dementia. Arch Neurol 1964; 10:333–359. Boeve BF. Progressive supranuclear palsy. Parkinsonism Relat Disord 2012; 18 (Suppl 1):S192–S194. Shukla R, Sinha M, Kumar R, Singh D. 'Hummingbird' sign in progressive supranuclear palsy. Ann Indian Acad Neurol 2009; 12:133. Adachi M, Kawanami T, Ohshima H, Sugai Y, Hosoya T. Morning glory sign: a particular MR finding in progressive supranuclear palsy. Magn Reson Med Sci 2004; 3:125–132. Pandey S. Hummingbird sign in progressive supranuclear palsy disease. J Res Med Sci 2012; 17:197–198. Itolikar SM, Salagre SB, Kalal CR. 'Hummingbird sign', 'penguin sign' and 'Mickey Mouse sign' in progressive supranuclear palsy. J Assoc Physicians India 2012; 60:52.